This spotlight is based on the early access version of Subnautica. Screenshots and impressions may not match the current version. There is no time frame for when the game will be finished at this time. The story of Subnautica is that you are the lone survivor of a ship that has crashed into an alien world. Without anyone else around, your only mission is to survive. Fortunately your escape pod comes equip with the bare essentials and a fabricator for building new things. With the entire world underwater, you’ll need to manage your O2 while diving for resources. Besides breathing, you also need to manage eating and thirst by finding ways to make edible food and purified water. The game’s progression model is all about finding the materials needed to produce new items, and in turn expand your options. Besides food and water, the majority of resources crafted are used to produce important items. 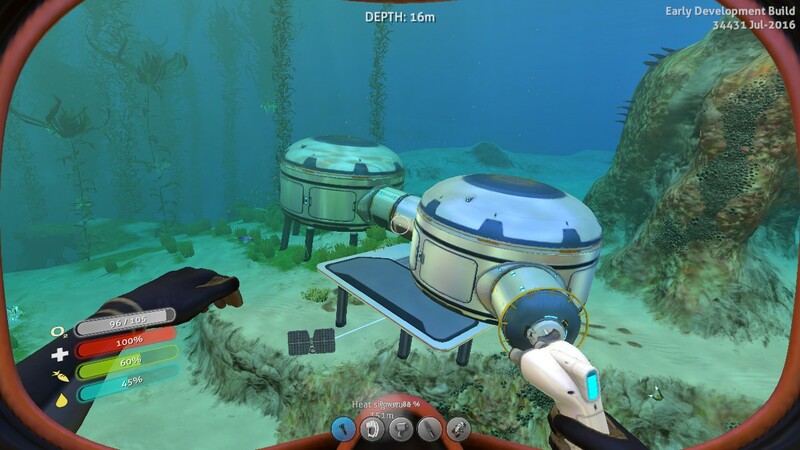 Eventually you’ll be able to set up your own undersea habitat as you keep expanding your resources. While Subnautica follows the same path as other survival games out there, the undersea design does help to make it stand out from the crowd. Subnautica at the moment does a good job of presenting items and resources in tiers. One of my problems with Don’t Starve was the fact that you always had to circle back to gather the lower tier resources, because they were always a part of mid to high tier crafting. Subnautica simply gates progression through finding resources and using them to craft new items. Many items you’ll produce in the game are meant to provide you with new options and open more of the game up. While there are items that have durability ratings, the main ones used for progression are everlasting as long as you have batteries to recharge them . Even though you’ll still need basic resources from time to time, you’ll eventually move on to bigger and better things. The idea is that the further you get away from your escape pod, the resources and threats will change. In the shallow parts, you’ll find basic resources and cute fishes. Go deeper, and you’ll find giant carnivores and the resources you need to improve your living arrangements. Safes are hidden around the world that unlock new items that can be used to enhanced your survival or give you new options. The use of the undersea motif gives you a huge world to explore. While you are technically on a timer due to your vitals, keeping your basic needs met can be handled very easily. The game’s pace does a good job of moving you away from worrying about basic survival to exploring the world. 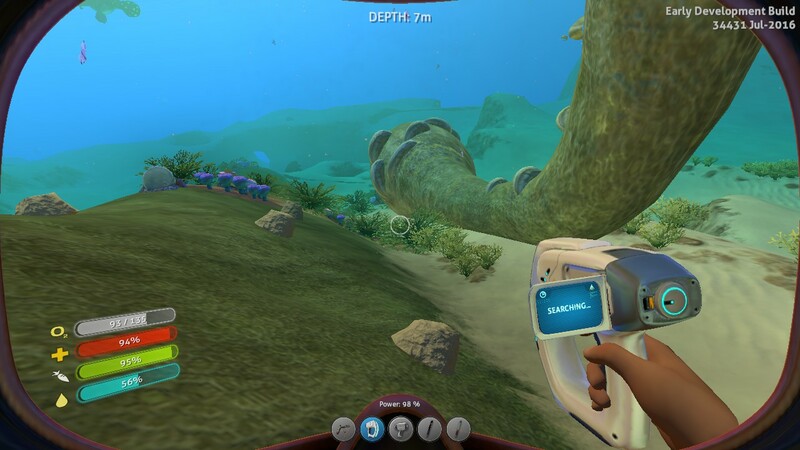 The ocean setting also makes Subnautica a lot more relaxing compared to other survival games. This is one of the few survival games where you can just take in the sites of exploring the world. 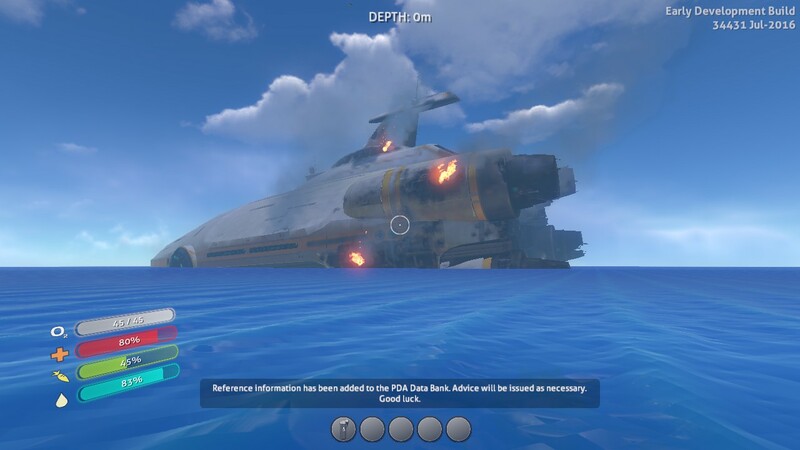 With that said, Subnautica doesn’t quite escape the current of other survival design issues. 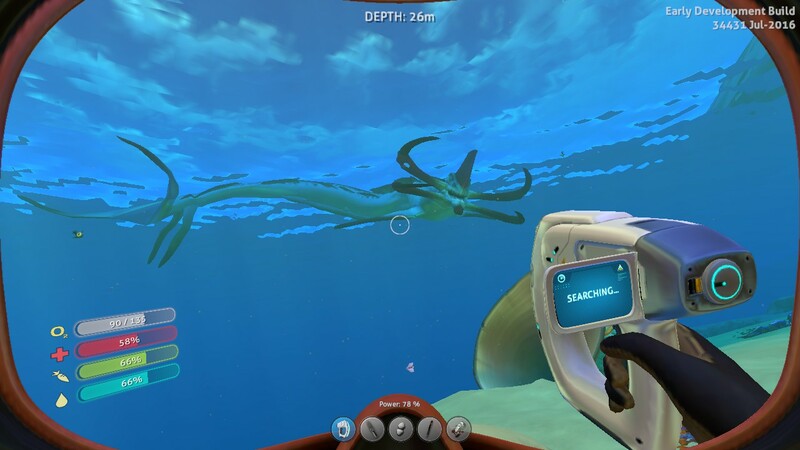 Subnautica, like most survival games, has basic problems indicative of the genre. The game simply doesn’t give the player any real motivation to go out and explore at this time. Because it’s so easy to keep yourself alive, the game lacks that sense of desperation and need to explore of games like The Long Dark. You’re going to have to motivate yourself to keep playing instead of having things to do. There are a few story beats to the game, namely exploring areas at the bottom of the ocean and the crashed ship, but they are not the focus. At this time, I don’t know if there is more planned from a narrative or objective point of view. Building your undersea habitat will take some time and busy work, but you are free to design however you want. Constructing bases is also where the developers have the most flexibility with adding new content in the form of furniture and utility items. I would have liked to see more starting or early ways of dealing with some of the obstacles you’ll run into. 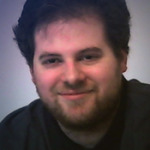 Namely avoiding or getting around threats and inventory. Expect to spend a lot of time playing inventory Tetris, as resources can take up one, four or more inventory spots per item. If you play enough, you will get the means to fight back against hostile animals. The catch is that it’s in the form of stun weapons and nothing that completely wipes out a threat. As with other survival-based games, once you’ve survived once, there really isn’t any reason to go back to the game. The world is static with respawning fish to restore vitals;further limiting replay value. 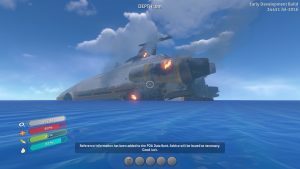 If you’re not a fan of survival games, Subnautica won’t change your mind on the genre. However, the change in setting and focus on progression instead of vitals does make it one of the more accessible survival games on the market. Maybe it’s the fact that I’m an Aquarius, but I could see myself returning to Subnautica for a trip under the sea, which for a survival game is a rare occurrence for me.